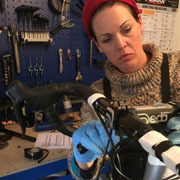 Our club service is ideal if you are an occasional cyclist who wants the peace of mind of knowing that your bike is road worthy. 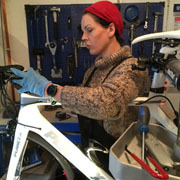 This service will enable you to confidently seize the opportunity for a ride when the sun next comes out, safe in the knowledge that your gears and brakes are safe and effective and your bike has been looked over by a qualified mechanic. Any worn or damaged components will be identified during the service and you will be advised should anything need replacing. Nuts and bolts – checked and tightened. Your bike will be taken for a test ride before being professionally cleaned and returned to you. All work carried out will be guaranteed for six months. 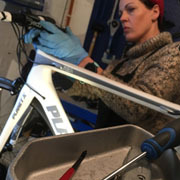 The Pro service is ideal for bicycles which have come to the end of a busy training or racing season or alternatively, bicycles which require preparation for a big race or epic journey. Imagine the reassurance of knowing that you can put your bike away for winter in the confidence that you will return to it in good as new condition next season. No bike will ever be turned away for being dirty, even if it's REALLY dirty! However, no bike will be returned to it's owner in anything less than gleaming condition. This is because the workshop needs to remain clean and tidy and it's rather nice to have your bike returned all clean and sparkling! 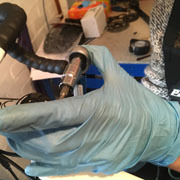 For this reason there may be an extra labour cost for particularly filthy specimens and customers are politely asked to be aware of this before leaving their bike for service or repair. Take the hassle out of selling your bike online by using our packup and send service. You'll get a better price by advertising nationwide delivery and you won't have the security risk of prospective buyers calling at your house. Includes all packaging including bike box, your bike will be posted using a tracked next day service.